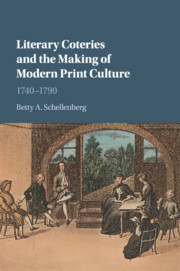 Literary Coteries and the Making of Modern Print Culture Schellenberg Betty A. Add to cart the imprimé à la demande of Schellenberg Betty A. Add to cart the livre of Schellenberg Betty A. Introduction: the literary coterie in the eighteenth-century media landscape; 1. Wrest Park and North End: two mid-century coteries; 2. Formation, fame, and patronage: the Montagu–Lyttelton coterie; 3. Identity and influence from coterie to print: Carter, Chapone, and the Shenstone–Dodsley collaboration; 4. Memorializing a coterie life in print: the case of William Shenstone; 5. 'This new species of mischief': Montagu, Johnson, and the quarrel over character; 6. Transmediations: marketing the coterie traveller; 7. Literary sociability in the eighteenth-century personal miscellany; Conclusion; Bibliography.